When I bought my first table saw, almost thirty years ago now, there really wasn't much information available on them except for what I could find in magazine ads. The only other source of info was the limited supply from local merchants. Not a lot of help when you consider how much you have to shell out for a decent saw. That's certainly not the case today, no matter where you live. With a click of your mouse you have access to more information than you know what to do with. The problem is that it's spread all over the place, and you have to search for it... all over the place. I found this out when I was looking for a new saw to replace "old faithful", who sadly bit the sawdust after a long and courageous struggle with worn-out-itis. This website puts all that information in easy to understand, detailed table saw reviews -- all in one place. And, it only includes the stuff you really need to know to make an informed decision. No fluff. How to make useful saw jigs and accessories. Tips on saw maintenance and alignment. Joinery methods and their uses. How to evaluate used table saws -- before you buy. How to get rid of all the sawdust you're going to make. That's just for starters. As this site grows, so will this list. My wife keeps telling me there's more to life than piddling around in my workshop, and if I ever find out what it is, I'll let you know about that too. Working with wood is probably one of the most enjoyable hobbies there is. You can create a beautiful piece of furniture or a birdhouse and still feel like a master craftsman. Your table saw plays a big part in that. How to cut a mitered rabbet joint on the table saw. 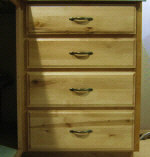 Making and installing solid wood drawer fronts on cabinet drawer boxes. Using vix bits for perfectly centered pilot holes in cabinet hardware. Resawing lumber into thinner boards with the table saw. 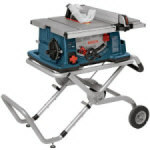 Bosch 4100 series table saw review. Craftex CT146 contractor table saw review. Kreg pocket hole jig review and how-to. Throughout this site are photos showing the table saw being operated without a guard and/or splitter attached to the saw. This is solely for the purpose of getting a clear photo to explain a procedure or technique and should not be construed as safe operating of a table saw. You are responsible for your own safety when operating your table saw and you should follow all proper safety procedures when doing so.